Discussion in 'The Workbench' started by Wilder Amplification, Oct 31, 2009. Here's a build I've got on the bench at the moment. '69 era circuit, using a Metro Dagnall clone and the Metro 1203-80-MS power transformer with high/low voltage HT secondary. 95% of the chassis wiring is complete...I've already built the board and just need to complete the chassis lace-up before installing it. Damn thats beautiful! Real fine work, great twist work on the Filiment wires and great right-angle runs. And it goes to eleven! yes , very clean work !!! its great to see that kind of attension to detail . Thanks for the compliments. 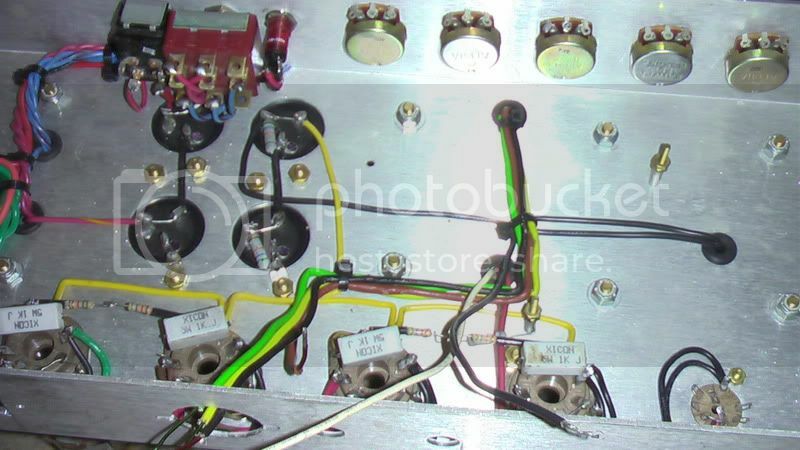 Lead/wire dress is key in these things to ensure a noise free amp and the reason why I never rush an amp build. I have a 3-4 week build time on all amp orders and the primary reason why is so that I can take my time and ensure that wire dress is done properly. Some of the most annoying problems like hum, oscillation, etc can be eliminated by simply taking the time to do proper wire dress. This is one of the things I love about building point to point wired amps...done properly, point to point can look like a real work of art. 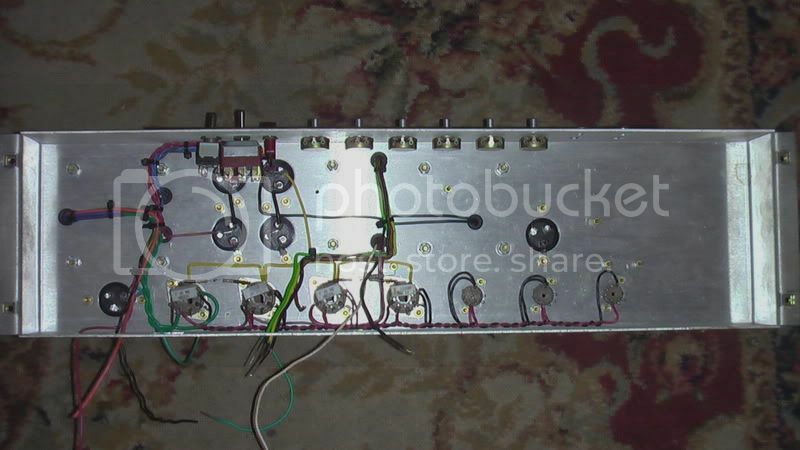 I see a lot of guys who order an amp kit, and they're so excited and ansy to get the amp fired up and running so they can hear how it sounds and end up with a rats nest wiring job all because they rushed the build. Their excuse is always "Well I'm a beginner and it's my first one", yet to me this is an invalid justification because I've seen complete beginners do some pretty immaculate wiring jobs on their first build. Why? Because they weren't in a race...they didn't rush the build. They asked lots of questions and they took their sweet time making sure that they got it 100% right first shot go. 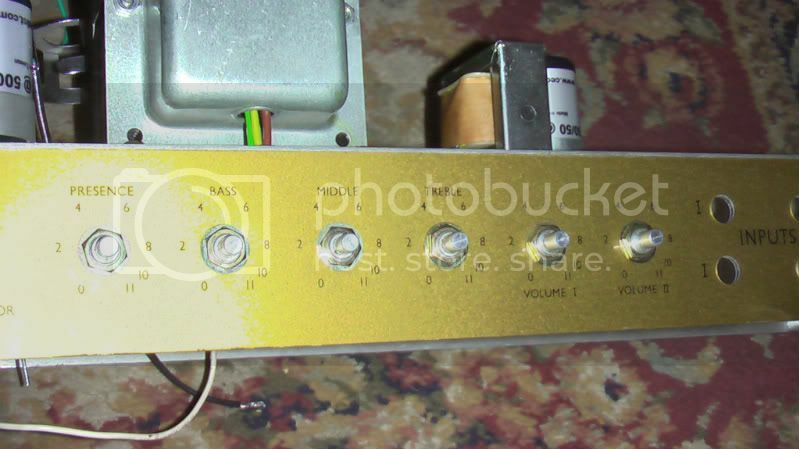 The whole "There's never enough time to do it right but always time to do it over" mentality never made sense to me...take your time and don't rush it, and you'll end up with a bitchin' sounding amp with no noise/oscillation issues. If you're unsure of something, don't hesitate to ask questions. One thing that also helps...don't work on it non-stop until you get it running. You'll get delirious and you start rushing it toward the end. Work on it for a couple hours, then take a break from it. Focus and take your time, it's not a race. 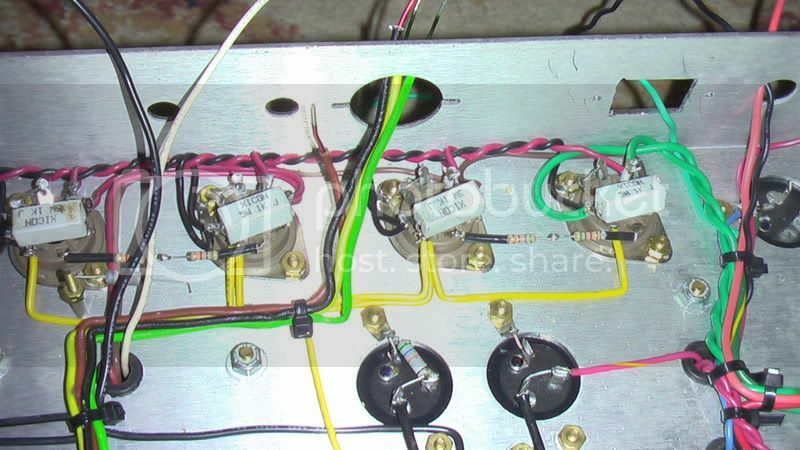 Even as a beginner, you know what proper wiring should look like. So if your wiring does not look as good as you know it should, try something different. 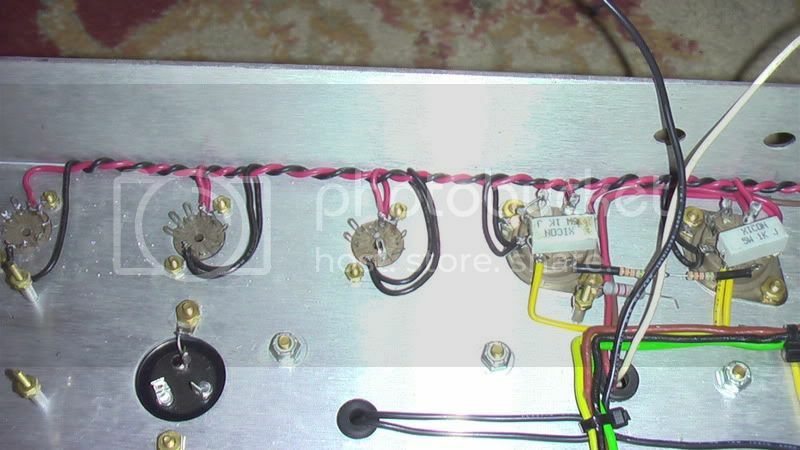 Practice soldering some scrap parts together before you attempt an amp build. And let the connection itself melt the solder...don't use the iron to melt it. Leave the iron on the connection point to heat it up, then apply solder to the connection while keeping the iron on the connection to keep it hot and the solder will flow right onto the connection. Once you've applied enough solder, THEN take the iron away. Solder flows to wherever the heat is...so if the connection is not hot enough, solder will not flow onto it. Keep the iron on the connection until the leads of the parts that you're soldering together are hot enough to melt the solder, then apply solder to those parts while keeping the iron on them until enough solder has flowed onto the connection. Seriously...yes, I take a lot of pride in my workmanship. I simply can't put my name on it unless it looks like that. Good stuff Jon. Real solid craftsmanship. Like You said, a "rats nest" wiring is a PITA to diagnose for hum, oscillation and random interference. 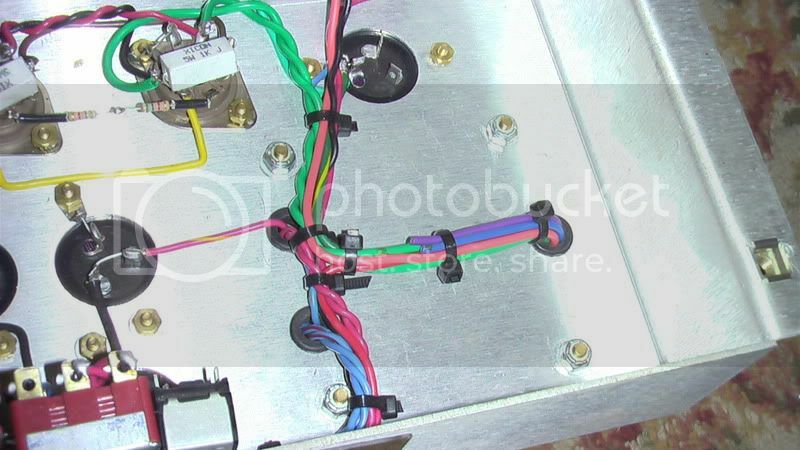 Done properly (neatly), troubleshooting any wiring is a breeze if necessary at all. My 2nd amp build was a kit and I took the time to do it as neat as I could. In hind sight, there are palces where I should have used more twist ties like you did. I wish I would have left myself more wire for my V3 heater to place it farther away - mistake on that part. Your amp is a good looking build for sure. Not as neat as yours, but I followed the original design as close as possible. I hate such neat wiring! (cos it makes the gadgets that I build look so bad! - I start neat, and then I want to tweak the design, and again etc, until it is a mess). The only thing I have with such craftsmanship in its construction is an old english 12 channel mixer, by Carlsbro. It's from about 1979and I renovated it for our band. Now those things could really be a rats-nest, but it is so beautifully wired by the good ladies of northern england, that I hope I haven't defiled it. This look very Dumble inside and Howard isn't a real neat freak. Maybe he's not. I guess he may be more of a "Let's get 'er done" sort of builder. Either way, many of his amps sound great. I like that all Aluminum Chassis, looks like you hand punched yourself? Also that open framed choke, how many Henries, DCR and max mA.? Actually no, the chassis is a CNC cut from Metro. The choke is a Mercury Magnetics 3.3H with 75 ohm DC resistance and 100mA current handling. Nice work of art. I see you offer 3 power tube choices, What tonal difference does it make ? Any clips other then the ones of your web site ? Hey Adam...thanks for the compliment. Tonal differences between power valves...EL34s have more of what most consider to be "the Marshall sound". The familiar midrange "bark" that most of us are very familiar with. 6550s...much more stiff sounding. Much later breakup/overdrive than an EL34. Think "Zakk Wylde". Even though his amps are 2203s (which we can also build btw), his amps use 6550s. KT88s to my ears are just a 6550 with tighter lows. Unfortunately no. I hope to make some new ones in about a month or so as I'm still working on building the amp you saw in the pics. This particular one will be my personal head and I work on it as I have time. 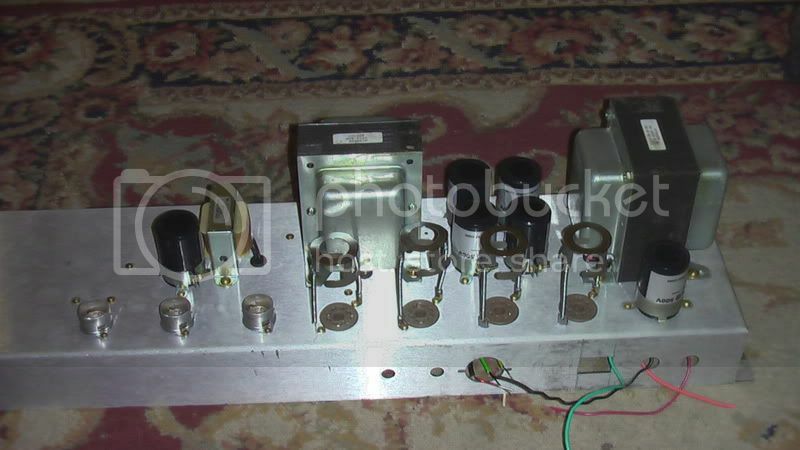 This one has a power transformer with a dual voltage secondary that allows you to switch between a low and a high B+ voltage while compensating for the bias at the same time. I haven't tried this feature yet and I'm dying to try it out as well as get some sound clips of it. But those who have tried it have said that it's like using a Variac but without screwing with the bias and heater voltage. 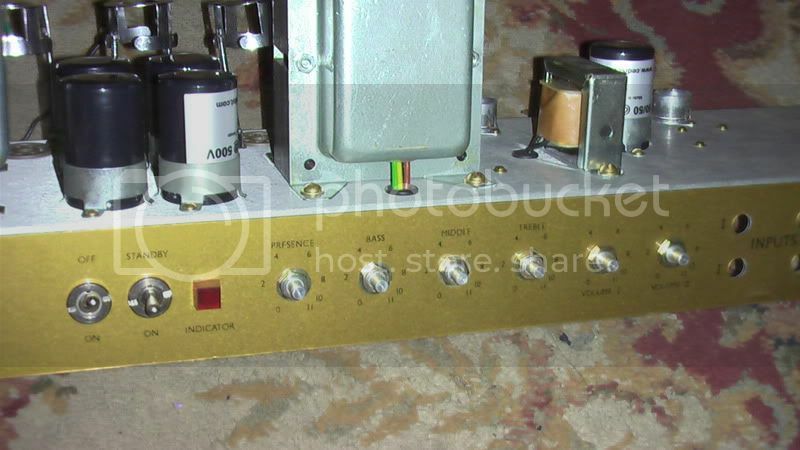 The prices you see for this amp are for the base configuration, which are Heyboer transformer equipped, carbon film resistors and Sozo caps. You can order them this way for the exact price advertised. However, since they are "built to order", there are options so if there's something custom that you want done to it I can do that as well, although pricing will vary due to what custom work or component variations you want. I can install an effects loop, PPIMV (master volume that goes AFTER the phase inverter as opposed to the standard master that goes BEFORE the phase inverter, which sounds amazingly close to what the amp would sound like on a power soak), Mercury Magnetics trannys, Sozo Mustard Vintage caps (vice the Mustard Standards they come with as standard). I can also build it to any spec '66 - '69, 12000 series, etc etc. I'm also working on a footswitchable hi-gain mod for these...not sure when that will be ready but it is in fact in the works. The sound clips are the same base config as advertised on the site. Very nice. The prices seem very reasonable as well.